If you have studied the astro methods of W.D. Gann, you would have discovered that when he was calculating price levels, he would often use the half-way point between two planets and even average them out. Here is a quote from his May Coffee Santos letter regarding the high on March 19 1954. “One-half of Jupiter to Saturn Helio is 152.09 or 2⁰ Virgo 09′. The Average of Saturn, Jupiter, Uranus and Neptune is 155.10 equals 5⁰Virgo 10′. In Gann’s private ephemeris, you will discover the same midpoint calculations on various pages. How can we use Gann’s planetary midpoint methods now? The easiest way to see midpoints is by using a 360 degree with a midpoint dial. Here I have located the Helio midpoint of Jupiter and Saturn in Gann’s example at 152. It also happens to be the midpoint of Mars and Jupiter and if we give it a little more orb, even the midpoint of Jupiter and Mercury. Using Market Analyst 7 Astro Edition, you can plot midpoints on your chart with specific harmonics and price scales. Below is a daily Dow Jones Chart with the same planetary midpoints, lines and averages used by Gann. The Blue lines are the transiting Jupiter/Saturn Helio midpoint, the Black lines are transiting Jupiter/Saturn/Uranus/Neptune Helio and the Red lines transiting Jupiter/Uranus Helio. Here I have used the same transiting midpoints and averages on a Weekly chart for the XJO. You can clearly see where the planetary midpoints act as support and resistance for price. 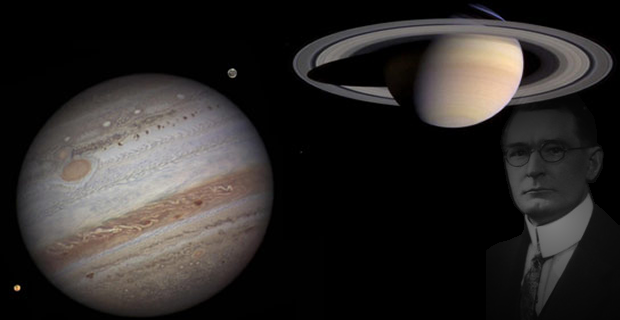 The current high is at the Jupiter/Saturn Helio midpoint. Again on chart 3, I have plotted the same lines on the AUDUSD daily, obviously if the transiting midpoints of planets cluster at one point in the zodiac, their price lines will join and this will be a very significant level of either support or resistance. Chart 4. S &P 500 Daily (showing how the transiting midpoints act as price tunnels). You can use transiting midpoints like Gann on any timeframe but you will have to modify the price unit scale and also the harmonics for intraday. Click here to listen to Olga’s latest interview on the Yorba radio network.